Single drum tray. Ideal under drums where dispensing or filling takes place to catch incidental spills or leaks. Holds one 30 gallon or one 55 gallon drum. Spill capacity: 10 gallons . Measures 31" diameter by 6" height. 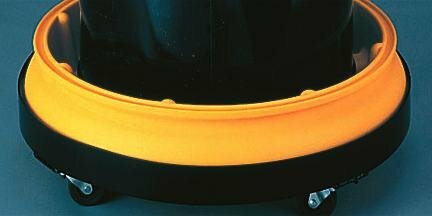 UltraTech Ultra-Drum tray without grate. Keeps floors free of spills - designed to collect and contain drips and overflows associated with filling of 55 and 30 gallon drums. Meets EPA Container Storage Regulations for 20 gallon or smaller containers with bottom grate in place. All polyethylene construction will not rust or corrode. Optional dolly available for easier transport / mobility. The Ultra-Drum Tray is used when working with a messy drum, one that you are pouring into or pumping out of. It catches any minor leaks or spills that may occur around the drum. Please note: This product doesn't meet capacity requirements for containment and shouldn't be used as a containment device. Octagonal shape saves space between drums. Catches drips, leaks and spills that can make your floor a big mess. With a 55-gallon drum in place, tray holds 5 gallons. Low density polyethylene with UV inhibitors. Outside measures 32-inches diameter by 8-1/8-inches height; 27-1/8-inches diameter opening. Compliance 40 CFR 264.175, UFC and SPCC. 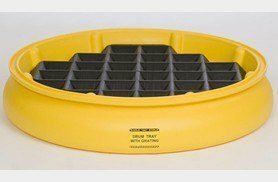 UltraTech Ultra-Drum tray with grate. 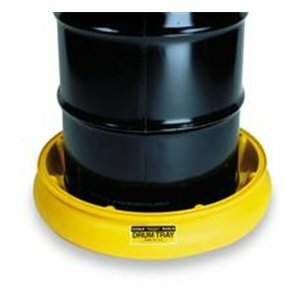 Keeps floors free of spills - designed to collect and contain drips and overflows associated with filling of 55 and 30 gallon drums. Meets EPA Container Storage Regulations for 20 gallon or smaller containers with bottom grate in place. All polyethylene construction will not rust or corrode. Optional dolly available for easier transport / mobility. The Ultra-Drum Tray is used when working with a messy drum, one that you are pouring into or pumping out of. It catches any minor leaks or spills that may occur around the drum. Please note: This product doesn't meet capacity requirements for containment and shouldn't be used as a containment device. Octagonal shape saves space between drums. Catches drips, leaks and spills that can make your floor a big mess. With a 55-gallon drum in place, tray holds 5 gallons. Low density polyethylene with UV inhibitors. Optional bottom grate elevates drums 2-5/8-inches and out of spilled liquid. Outside measures 32-inches diameter by 8-1/8-inches height; 27-1/8-inches diameter opening. Compliance 40 CFR 264.175, UFC and SPCC. 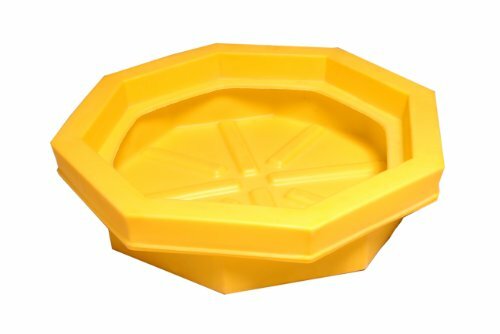 UltraTech Ultra-Containment tray. Versatile secondary containment for small containers and packages. Low profile, 16.5 gallon sump is perfect for containment of 5-gallon pails, batteries, safety cans, dry cleaning waste drums and leaky machine parts. All polyethylene construction will not rust or corrode. Meets EPA container storage regulations for small packages with grating in place. Measures 54-inches length by 29-3/4-inches width by 3-1/2-inches height. 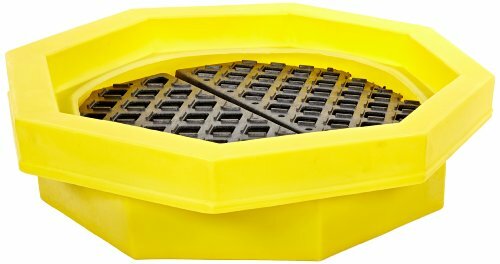 Eagle 1615 Single-Drum HDPE Spill Tray w/Grating, 31"
R.S. Hughes carries a large selection of product shapes and sizes to help best meet your specific applications. Width, length & height are some of the more common measurements to consider. This SKU has a 31 in length x 6 in height. 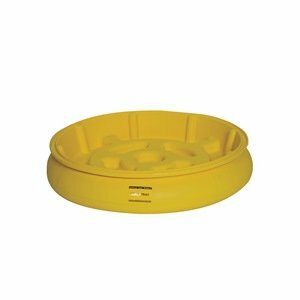 The Eagle drum tray is made of high density polyethylene, comes in yellow and is for use with 1618 - Drum Tray Dolly. This product comes with the following: Grate. 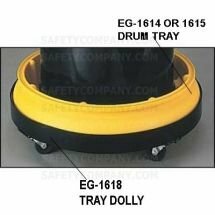 Eagle Drum Tray Ideal under drums where dispensing or filling takes place to catch incidental spills or leaks. Holds one 30-gallon or one 55-gallon drum and is available with grating (Model 1615) for 5-gallon containers or batteries. Shown with optional Model 1618 Drum Tray Dolly. Specifications: Dimensions: 31" diameter x 6" high Spill Capacity: 10 gallons Weight: 20 lbs. Sold Each. *Please Note Lead Time is 3-5 Days. Copyright © Wholesalion.com 2019 - The Best Prices On Eagle Drum Tray Online.